A Suzuki Porsche? What kind of madness is this? But the answer is simple. We are looking at an example of the toy company Suzuki - not the car manufacturer. And unfortunately there is not a lot to I know. Suzuki was a Japanese manufacturer of tinplate toys. 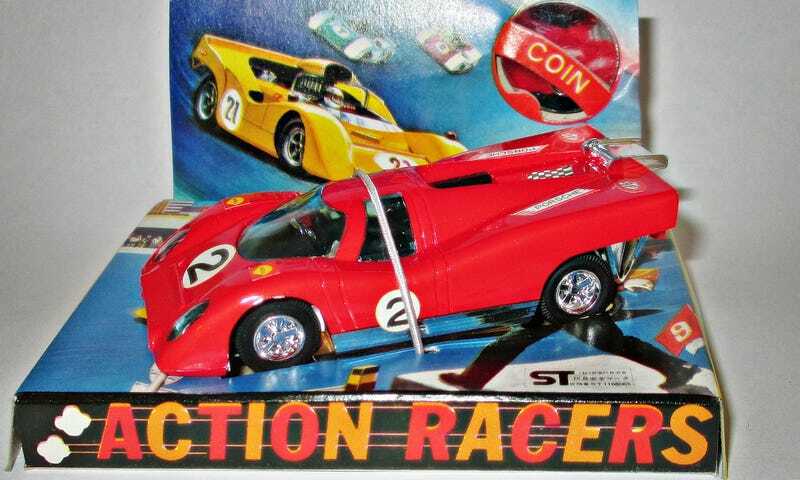 And later they made little wind up racers like this one. The body is all plastic, and the wind-up motor is operated by the supplied aluminium “coin” on the back of the card. So there is no pull-back action here. There is very little on the net about this brand, or these little cars. They came to me via an ebay seller who had sold me several Diapet models. He couldn’t sell these, so he gave me a good price and asked if I might want them. Of course, the answer was “Yes”. Obscure Japanese models are always something I’m interested in. The base plate does not offer any information either. As you can see, this is the base of a second model I bought from the seller. I can’t get the Porsche off the cardboard without pretty much destroying most of original packaging. And I’m thinking there can’t be too many left of these on the original package. The blue car is a Ferrari 312PB, I think? Anyway, that packaging was already ripped, so I can show that one. I’m not really sure when these were made either as there are no dates on the cars or the packaging. I’m guessing mid to late 1970s. Judging by the card on the back, there was at least one more casting - the Nissan R382. But what else was there? I might never know. So, there’s another little strange interlude from me for you. If anyone here knows more, please do let know.